American DJ InnoRoll HP is a update to their best-selling Inno Roll and is 30 watt more powerful than before ! The ADJ Inno Roll HP has an 80 watt led light source and a superb features features for mobile dj's, nightclubs, bars and events companies including: 8 Colors and White, 6 Replaceable Gobos and Spot, Electronic Dimming 0 - 100% via dmx control, 5 Dimmer Curves and a beam angle of 10 degrees. 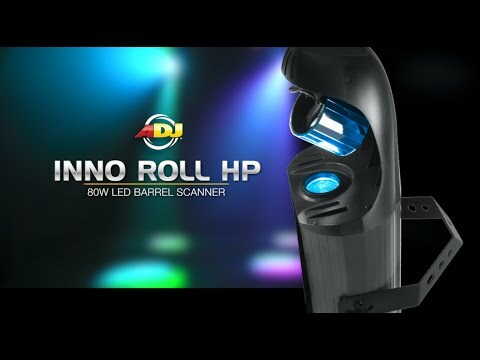 Considering purchasing the American DJ Inno Roll HP? Have questions? Ask people who've recently bought one. 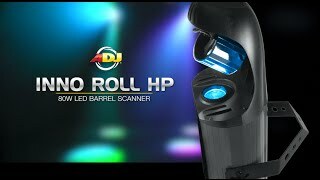 Do you own the American DJ Inno Roll HP? Why not write a review based on your experience with it. Quite expensive but definately worth it as the effects are stunning, great colours and unbelievably bright led. I'm giving a 5 star as they did at firs make a mistake, they sent me a inno roll & a inno scan, but I rang up & they said no problem box it up & we will send a replacement & it will be with you the next day & they will collect the other at the same time. True to their word the next day it was all sorted & im one happy customer, well apart from I got to buy another flight case :) Thank you DJ Kit for a great service. Seen a video for American DJ Inno Roll HP online or have you own video? Check out American DJ Inno Roll HP on DJkit.com!